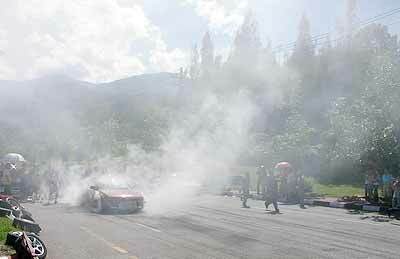 The source of Chiang Mai’s haze is finally discovered. Burning up the engine is not. 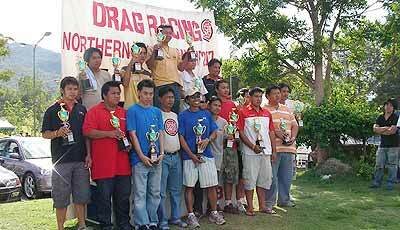 Some of the proud winners and their trophies. It looked like no contest at all. Local hero Boonchoo Yeenoy lined up his 12 year old Toyota 1.3 front-drive hatchback against the brand new 3.0 litre, rear drive Supra Coupe of Suriyon Janchaisaeng from Bangkok. The lights flashed down the Christmas tree and on green the tires spun, the turbos howled and away they went down the 700 Year Sports Stadium exit road with the crowd on tip toes. Quite unbelievably, it was the little brown ECU sponsored hatchback that stopped the clocks at 8.344 seconds, shutting down the streamlined visitor who crossed the line a whole 1.279 seconds later. 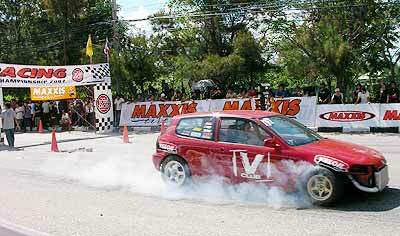 It was a fairytale ending to another great monthly Sunday drag meet organized by Khun Anusorn of Bodyshop Sport, himself a former successful rally driver. Other top car times at the June meeting were: Komsan Saengjan (ECU Shop Mazda) 9.012; Wasin Lurdkiatdamrong (Exist Team Mitsubishi Evo III) 9.391 and ‘Thomas’ (Race Dynamic Honda Civic) 9.506. 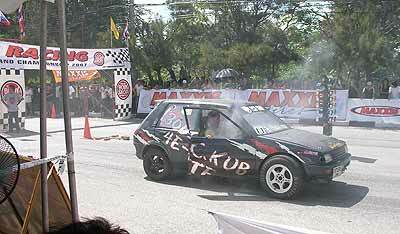 Burning rubber is an essential maneuver at drag races. Difficult to keep the eye on the ball with views like these at the Spring City Golf Resort, Lakes course. There are several places in the world that have laid claim to being the inspiration for the mythical paradise of Shangri-La in James Hilton’s book “Lost Horizons”. Probably the strongest claim comes from Yunnan province in China, and there even is a town of the same name near to the stunningly beautiful Dali and Lijiang in the north east of the region. The main city of Yunnan is Kunming and here we definitely find a “Shangri-La” for discerning golfers. Voted as one of the best courses in Asia, The Spring City Golf resort employs some 500 greens staff. Kunming is known as the city of eternal spring, and has an ideal climate virtually all year round, clear blue skies and a warm climate that is not at all humid. There are many excellent hotels and though the city is modern with a well planned infrastructure, parts of the old town are still preserved and atmospheric. The shopping is comprehensive and excellent value; there is a good selection of quality restaurants, the streets and pavements are clean and wide, and getting around is easy either by road or on foot. The wonderful secret of Kunming is the quality of its golf courses. There are five world class championship 18s within easy reach of the city, each one in pristine condition and a pleasure to play. The most well known golf resort is Spring City, around 40 minutes from town. It has two courses: the Lakes Course, designed by Robert Trent Jones Jr., and the Mountain Course which is one of Jack Nicklaus’ finest. Spring City Golf & Lake Resort is one of the most beautiful golf resorts in the world, set amidst majestic mountains and a crystal breathtaking lake, with sunny skies and lovely spring weather all year round. Both golf courses there are immaculate, which I suppose is hardly surprising considering that over 500 green staff are employed. The whole facility is amazing, and it has won the award of “best golf resort” and “best golf course” in Asia on numerous occasions since its opening in 1999. As you walk around the clubhouse the walls are decked with dozens of accolades from golf publications all over the world. Only 20 minutes from town is Kunming Sunshine Golf Club, another Robert Trent Jones Junior design. Here you are greeted with a stunning panoramic view of the course when you arrive, with a scenic mountain backdrop. Sunshine is a pleasure to play and in perfect condition. The oldest course is Kunming Country Golf Club, only around 15 minutes from town and designed by Les Watts, the talented Australian golf course architect. 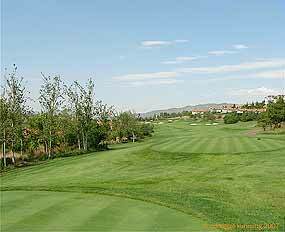 This course is built on a huge plot of land and has some classic golf holes. You are made to feel very welcome at KCGC. The newest course is the Nick Faldo designed Lakeview Golf Club, on the outskirts of town with easy access. This is a credit to the design team, challenging and it is in great shape. Lakeview Golf Club has spectacular views of the famous Xishan Mountain, which has significant cultural importance in Chinese history, and the adjacent 300 square kilometer Dianchi Lake is the 6th largest lake in China. Golf in Kunming is best played on weekdays as the courses are sometimes crowded at weekends; Monday to Friday is seldom busy. On rest days from golf there are numerous sights to see: Yunnan is a province of natural wonders plus a huge range of fauna and flora. A definite must see is the stone forest around 45 minutes from town, the largest Karst Limestone Forest in the world. In and around town Green Lake is worth a visit, as is the Flower Market, various preserved old Chinese houses, and exploring a real Chinese tea shop is a must. Shopping is great value and there is a huge selection of bargains to be had in clothing, electrical items, souvenirs and IT equipment. And there’s more – not far from Kunming is Lijiang, a world national heritage site, only a short flight away with around 20 flights available every day. Two more great courses are in Lijiang, including at 3100 meters the fabulous Jade Dragon Snow Mountain Golf Club, with fine weather throughout the year and located at the scenic western foot of the Jade Dragon Snow Mountain. This 18 hole; par 72, 8548 yard golf course was designed by Neil Haworth. He has created the longest course in the world and a unique snow mountain golf course. The second course is Lijiang Ancient Town Lakefront Golf Club, located at the foot of Mount Wenbi and only 8 km from the Lijiang. Winding along Wenbihai Lake with Yulong Snow Mountain in the background, the golf course features beautiful natural views. 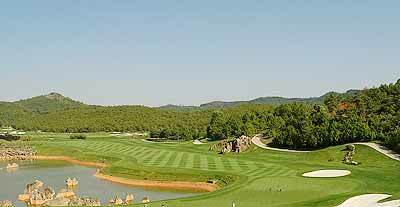 Last but not least of the eight world class golf courses playable from Kunming is Dali Stone Mountain Golf Club. Situated to the right of Dali’s famous Three Pagodas and Chongsheng Temple, the Club faces Lake Erhai, with its back to the Cangshan Mountains. Take a trip to golfing Shangri-La before everyone else discovers it. Designed by Robert Trent Jones Jr. the Kunming Sunshine Golf Club is only 20 minutes from the city.